I believe you would enjoy it more, or at least get more out of it, if you were already familiar with this series, which I’m not, because this book is set fifteen years before Beyond the Veil. 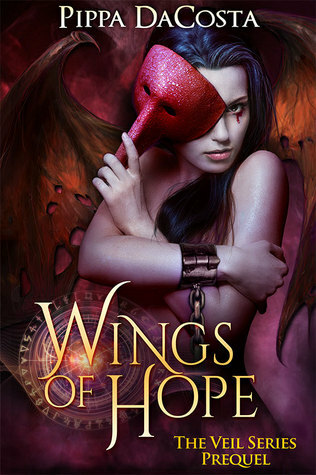 Wings of Hope was a pretty dark story about a half-demon/half-human girl named Muse, that is a slave to a very abusive full-demon named Da’mean (he’s so awful, even his name has mean in it). Muse has been passed from owner to owner since she was very young, because half-demons are viewed as lesser and only really capable of being slaves of some sort. Well, that all changes for Muse when she meets Mammon, Prince of Greed, for the first time. He sees something in her, and makes Da’mean let him borrow Muse. On her mini-vacation with Mammon, he helps her hone her fire elemental power and tells her about her true heritage and a world beyond the veil that is all humans. The next book, Beyond the Veil, is actually free (as of today) on Amazon, which I did buy, but I’m not sure if I’m going to read. I’ll be honest; this book did very little to make me excited to continue on with this series. Also, this novella was only fifty pages, but the font of this was like 72 pt and I legitimately felt like an angry little old lady while reading this.